The Florida TRADE Manufacturing Network (FTMN) is a group of state and community colleges, state and regional manufacturing associations, state and local CareerSource boards, Chambers of Commerce and local Economic Development Councils. The mission of FTMN is to connect Florida colleges, manufacturers, and Florida organizations in order to share best practices, job openings and placements in manufacturing, and manufacturing programs and curricula. Looking for a career in Florida, click these links. You may also call Employ Florida at 1-866-FLA-2345. Florida Advanced Technological Education Center provides resources for teachers and students. High school students shopping for information about careers and job opportunities should check this site out. Made in Florida, sponsored by FLATE and Manufacturers Association of Florida, is a website and educational program designed to educate individuals about manufacturing careers. The focus is on students planning their career path. Visit these sites for information on voting, elections, candidates, and constitutional amendments. Visit this site for the latest information on Florida elections, voting, and candidates. Visit this site for information on congressional elections and voting. The Government links will lead manufacturers to those agencies with which they may do a significant amount of business within Florida. For everything about jobs, careers, and employment in Florida, check this site. Responsible for reviewing and commenting on rules that could adversely affect small businesses. Space Florida was formed in 2006 for the purpose of strengthening, diversifying and expanding Florida's role as a global leader in space and aeronautics. My Florida is the central webpage that takes you to all the Florida government agencies and personnel. From here you can go to individual agency web pages. The Florida Department of Revenue administers the state's taxation program. This website contains information about applying for tax exemptions, registering to collect taxes, workshops, rule development, and programs. The Florida Department of Environmental Regulation is Florida's environmental regulatory and land management agency. The website posts meetings, workshops, proposed rules, rule comments, press releases and more about its programs. This site contains the Governor's press releases and special initiatives. This is the Governor's Office of Technology, Tourism, and Economic Development. Economic development is handled here. The business-led policy and investment board charged with guiding workforce development statewide to connect employers with qualified, skilled talent and Floridians with employment and career development opportunities. This site tracks manufacturing information relevant to the State of Florida. This site links buyers looking for quotes with sellers around the world. To increase your competitive edge, learn more about the Sterling performance improvement system. 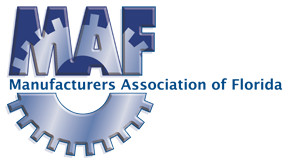 NAM is the national association for manufacturers. The Institute, associated with the National Manufacturers Association, is the leading research, education, workforce and services group supporting US manufacturers. The Council is the national advocacy group for the chemistry industry. This public/private partnership agency is Florida's state economic development agency. EFI provides assistance to businesses looking to locate or stay in Florida.